Media hype over Reiwa, the newly announced name for the upcoming era, continued unabated Tuesday. At the same time, a majority of people appeared to happily welcome the name, which means “auspicious” (rei) and “peace” or “harmony” (wa). However, the choice of the era name seems to reflect some important political considerations on the part of the government of Prime Minister Shinzo Abe: For the first time, the two kanji chosen for the name were taken from Japanese classical literature, not Chinese. 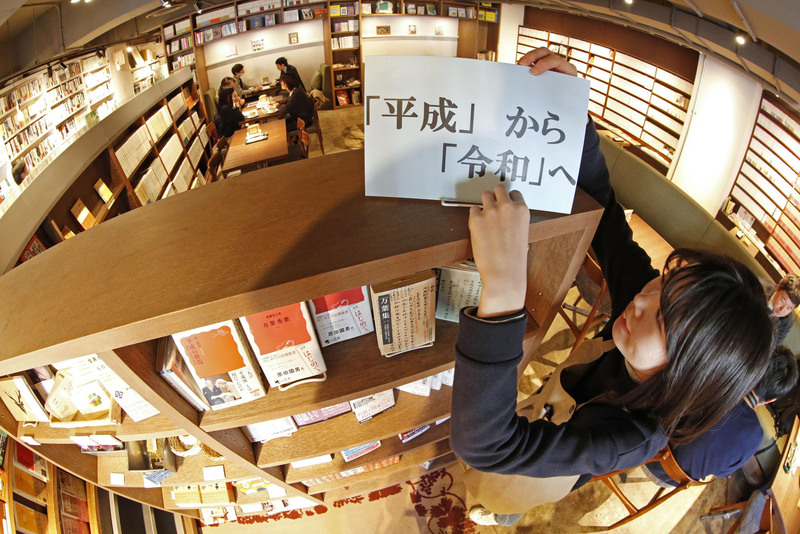 A growing sense of rivalry with China has apparently prompted Abe and other key Cabinet members to distance themselves from Chinese literature, which has long been the traditional source when it comes to choosing a new era name. But ironically, the passage that inspired the new name was apparently influenced by a Chinese classical poem. According to Defense Minister Takeshi Iwaya, Cabinet members “shared the feeling” that the new era name must be chosen from a Japanese classic book, not a Chinese one. “Japan was long under the influence of Chinese civilization, and it enjoyed great benefits from it,” Iwaya told a news briefing Tuesday at the Prime Minister’s Office. “But Japan has cultivated its own unique culture over thousands of years. So it was very meaningful that (kanji) were chosen from a Japanese book this time,” he said. The two kanji used for Reiwa came from the introduction to a set of 32 flower-themed poems included in “Manyoshu,” Japan’s oldest existing anthology of waka poems. Abe praised “Manyoshu,” pointing out that people from a variety of social classes — ranging from emperors, warriors and farmers — all contributed poems to the book. The era name will be a symbol of Japanese people’s love of culture and the country’s rich nature, he said. Tuesday’s editorial in the conservative daily Sankei Shimbun sounded much more upbeat than Abe, saying it welcomes the new era name. However, the introduction in question was written only with Chinese grammar and Chinese characters, based on a Chinese classic poem. According to experts, this sentence was based on a classic Chinese poem by Zhang Heng (78-139), which was believed to have been widely read by Japanese intellectuals at that time. Many Japanese have the impression that “Manyoshu” is Japanese classic literature, but the introduction in question and some other parts were written only with Chinese characters using Chinese grammar, said Asao Kure, an associate professor at Kyoto Sangyo University. 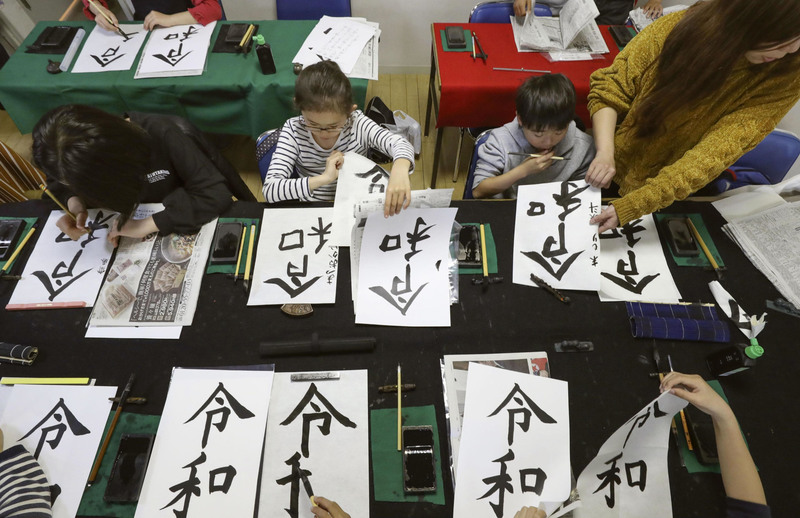 “(Japanese people) were trying to create something original while using Chinese culture as a reference,” said Kure, who specializes in legal history and is also an expert on Imperial era names. Originally Japanese people didn’t have a writing system at all and instead introduced Chinese characters, now called kanji, sometime during the 5th century. Later, Japanese people invented kana phonograms but many Japanese classic works were written only with Chinese characters using Chinese grammar. In some works, like most poems in “Manyoshu,” Chinese characters were used as a phonetic equivalent of Japanese words. 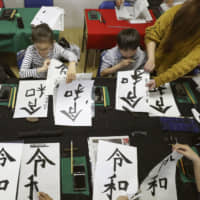 Kenji Yamazaki, professor of Japanese literature at Meiji University in Tokyo, said it is probably difficult to find something that is purely Japanese and can be used for gengō given the hybrid nature of the Japanese writing system. Yamazaki also said he feels the hybrid nature of “Manyoshu” may suggest a continuing resonance for people in the upcoming new era: creating something new by absorbing something from the outside world. Meanwhile, Kure of Kyoto Sangyo University also said people shouldn’t focus too much on the meanings associated with one kanji that constitutes the gengō. “The new era name draws on a text about nature, which is unlike the previous era names,” he said. “Past era names have usually posited specific political principles, but Reiwa instead puts forth a new kind of social philosophy inspired by nature — one that aims to achieve harmony among individuals in the same way that harmony and balance is found in natural phenomena,” he explained. “I do feel that the new gengō is aligned with modern ways of thinking, in that it focuses more on harmonious relationships between individuals to create a diverse society, rather than putting forward a specific principle,” Kure said.